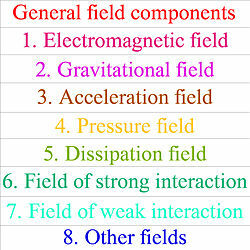 General field is a physical field, the components of which are the electromagnetic and gravitational fields, acceleration field, pressure field, dissipation field, strong interaction field, weak interaction field, and other vector fields acting on the matter and its particles. Thus, the general field is manifested through its components and it is not equal to zero, as long as at least one of these components exists. Fundamental interactions, which include electromagnetic, gravitational, strong and weak interactions, that occur in the matter, are part of the interactions described by the general field. The general field theory represents one of the variants of the non-quantum unified field theory and is one of the Grand Unified theories as well. Table 1 shows notation for all the fields, which are the components of the general field. In Table 1, the vector is the Poynting vector, the vector is the Heaviside vector. where is the Lagrange function or Lagrangian; is the time differential of the coordinate reference frame; and are the constants to be determined; is the speed of light as a measure of the propagation speed of electromagnetic and gravitational interactions; is the invariant 4-volume expressed in terms of the time coordinate differential , the product of space coordinates’ differentials and the square root of the determinant of the metric tensor, taken with a negative sign. 3) the variation of the metric tensor. Due to the principle of least action, the variation must vanish. This leads to the vanishing of the sums of all the terms, standing before the variations , and , respectively. As a consequence, the equations of the general field, the four-dimensional equation of motion and the equation for the metric follow from this. By definition, the integral of action should be the sum of the integrals over the 4-volume on all the elements of matter, and the entire volume occupied by fields. In many cases, the physical system contains elements of matter, in which the ratio of is different from the average. In this case, the equation for the field, the motion of matter and the metric will depend not only on local ratio , but also on the ratio of charge to mass in other matter elements that is implemented through a total field of these elements. where and denote the system’s momentum and the velocity of motion of the center of mass. At equilibrium state, we can assume that equation (5) is satisfied separately for the tensor of each field, and not only for the entire sum of tensors of particular fields. Similarly, under the condition equation (4) can be divided into seven separate equations, in which the mass 4-current is the source of one or another particular field. Here is the acceleration tensor, is the electromagnetic tensor, is the gravitational tensor, is the pressure field tensor, is the dissipation field tensor, is the tensor of the strong interaction field, is the tensor of the weak interaction field. where is the gravitational constant, is a certain constant and the gauge condition of the cosmological constant is used. where are some coefficients, is the electromagnetic stress-energy tensor, is the gravitational stress-energy tensor, is the acceleration stress-energy tensor, is the pressure stress-energy tensor, is the dissipation stress-energy tensor, is the stress-energy tensor of the strong interaction field, is the stress-energy tensor of the weak interaction field. As we can see, the stress-energy tensor of the general field contains not only stress-energy tensors of particular fields, but also the cross-terms with the products of strengths and solenoidal vectors of particular fields. where is a constant, which is part of the definition of the acceleration stress-energy tensor. In the article  the general field was divided into two main components. One of them is the mass component of the general field, the source of which is the mass four-current . The source of the second one – the charge component of the general field – is the charge four-current . The mass component of the general field contains the gravitational field, acceleration field, pressure field, dissipation field, fields of strong and weak interaction, and other vector fields. The charge component of the general field represents the electromagnetic field. As a result of dividing the general field into two components the field equations have become more independent of each other, since the invariability condition of the ratio of the invariant charge density to the invariant mass density is no longer required. To denote the field functions of the mass component of the general field, the same notation is used further, which are specified in Table 1 for the general field itself. consisting of the components of the electromagnetic field strength and the components of the magnetic field . where is the acceleration field constant, is the pressure field constant, is the gravitational constant, is the dissipation field constant,  is the constant of the macroscopic strong interaction field,  is the constant of the macroscopic weak interaction field. In a stationary case we can assume that the energy in the system is distributed in accordance with the equipartition theorem. According to this theorem, for systems in thermal equilibrium under conditions, when quantum effects do not play a big role yet, any degree of freedom of a particle, which is part of the energy as the power function , at the average has the same energy , where is the Boltzmann constant, is the temperature. The particles of the ideal gas have only three degrees of freedom of this kind – they are three components of velocity, which are a squared term of the kinetic energy ( ), therefore the average energy of the particle is . In general case, the particles have their proper fields, and the strengths and solenoidal vectors of these fields are squared terms of the corresponding stress-energy tensors. With this in mind, it is assumed,  that the equipartition theorem also holds for the field energy in the sense that the energy of the system in equilibrium tends to be distributed proportionally also between all the existing fields in the system. In equilibrium, we can expect that the particular fields as the components of the general field become relatively independent of each other. In this case, for each field their own field equations must hold, and the equations of the general field (4) and (5) are divided into sets of equations for each particular field. All these equations have a form similar to the Maxwell's equations. The following solutions were calculated assuming that the cross-terms in (7) are equal to zero. This implies complete independence of particular fields so that not only the equations of particular fields are independent of each other, but also the way how the general field energy simply equals the sum of energies of particular fields. Since the particular fields do influence each other, these solutions can be considered as a first approximation to the real picture. where is the distance from the center of the body to the point where the metric is defined; is the energy of the gravitational field inside and outside of the body; is the energy of the electric field; , and are the mass, charge and radius of the body, is the electric constant; are the coefficients to be determined; are the numerical coefficients of the order of unity, in case of the uniform density of mass and charge of the body they are the same and equal approximately the value 5/3. In this case it appears that the metric depends both on the ratio of the body radius to the radius vector to the observation point, and on the ratio of the total field energy to the rest energy of the body. From the equality it follows that ideal spherical collapse is possible when the system’s energy does not change when the matter is compressed. In addition, the gravitational mass appears to be larger than the system’s mass . This is due to the fact that the particles are moving inside the system and their energy is greater than if the particles were motionless at infinity and would not interact with each other. Calculation shows that the energy of the electromagnetic field reduces the gravitational mass. Therefore, adding a number of charges to a certain body could lead to a situation when the gravitational mass of the body would begin to decrease, despite the additional mass of the introduced charges. This follows from the fact that the mass of the charges increases proportionally to their number, and the mass-energy of the electromagnetic field increases quadratically to the number of charges. We can calculate that if a body with the mass of 1 kg and the radius of 1 meter is charged up to the potential of 5 Megavolt, it would decrease the gravitational mass of the body (excluding the mass of the added charges) at weighing in the gravity field by mass fraction, which is close to the modern accuracy of mass measurement. Here, the gauge mass is related to the cosmological constant and represents the mass-energy of the matter’s particles in the four-potentials of the system’s fields; the inertial mass ; the auxiliary mass is equal to the product of the particles’ mass density by the volume of the system; the mass is the sum of the invariant masses (rest masses) of the system’s particles, which is equal in value to the gravitational mass . The conclusion that as the electric charge increases the system’s mass may decrease remains valid, however this applies not to the gravitational mass , but to the inertial mass of the system. where and are the charge and mass of the system, and their ratio within the assumptions made can be interpreted as the ratio of the charge density to mass density. where is the temperature in the center; is the particle mass, for which the mass of the proton is assumed (for the systems the basis of which is hydrogen or nucleons in atomic nuclei); is the mass of the system within the current radius ; is the Boltzmann constant. where is the pressure in the center; is the mass density in the co-moving frame of a particle; is the Lorentz factor in the center. These formulas are well satisfied for various space objects, including gas clouds and Bok globules, the Earth, the Sun and neutron stars. The only significant discrepancy (58 times) has been found for the pressure in the center of the Sun. However, if we take into account the presence of thermonuclear reactions in the Solar core, which can be described by introducing the strong and weak interaction fields, then the increased pressure in the center of the Sun can be explained by the influence of these fields. In this case, for the constant in the stress-energy tensor of the strong interaction field we obtain the estimate: , which coincides with the coefficients and for the acceleration field and pressure field, respectively. In all cases the scalar potentials of particular fields inside the bodies change proportionally to the square of the radius, as it happens in case of the gravitational field. which allows estimating the internal temperature, pressure and other parameters of cosmic bodies for the case of non-uniform density. Due to the Poynting theorem, both the sum of the energy densities of all the fields inside the body and the sum of the vectors of the energy fluxes of all the fields inside this body become equal to zero. Outside the body, the energy flux of the gravitational or electromagnetic field accurately compensates for the change in the energy of the corresponding field in each selected volume. As a result, the 4/3 problem disappears inside the body, but it remains for fields outside the body. The solution of the 4/3 problem with the example of the electromagnetic field is reduced to the following: the requirement of the equality of the mass-energy associated with the time component of the stress-energy tensor of the field and the mass-energy of the energy flux of this field in the tensor components , is wrongful. The point is that these tensor components do not constitute a four-vector and therefore cannot contain the same mass-energy, as it occurs in the four-momentum. If we assume the local equilibrium condition and the validity of the theorem of energy equipartition, then for each particular field it is possible to use with sufficient accuracy their own field equations. As a result, for the pressure, for which its field equations were previously not known, we obtain specific wave equations for the scalar and vector potentials of the pressure field and the equations for the strength and solenoidal vectors of the pressure field. Similar equations are valid for the dissipation field, electromagnetic and gravitational fields, acceleration field, etc. This allows us to close the system of equations for the moving fluid with the fields existing in this fluid and to make this system of equations basically solvable. where denotes the radius-vector of the -th particle, is the force acting on this particle, and the value exceeds the kinetic energy of the particles by a factor equal to the Lorentz factor of the particles at the center of the system. where is the speed of light, is the acceleration field constant, is the mass density of particles, is the current radius. The relation between the theorem and the cosmological constant, characterizing the physical system under consideration, is shown. The difference is explained between the kinetic energy and the energy of motion, the value of which is equal to half the sum of the Lagrangian and the Hamiltonian. The relativistic energy, total energy, binding energy, fields’ energy, pressure energy and the potential energy of the system of particles and four fields (the general field components) are calculated in the relativistic uniform model,  and then are compared with the kinetic energy of particles and with the total energy of the gravitational and electromagnetic fields outside the system. Another result is the fact that the inertial mass of the system is less than the gravitational mass, which is equal to the total invariant mass of the particles that make up the system. It is also proved that as increasingly massive relativistic uniform systems are formed, the average density of these systems decreases in comparison with the average density of the particles or bodies making up these systems. The model allows us to estimate the particles’ velocity at the center of the sphere, the corresponding Lorentz factor , the scalar potential of the pressure field; to find the relationship between the field coefficients; to express the dependences of the scalar curvature and the cosmological constant in the matter as functions of the parameters of typical particles and field potentials. Besides, comparison of the cosmological constants inside a proton, a neutron star and in the observable Universe allows us to explain the problem of the cosmological constant arising in the Lambda-CDM model. The general field is assumed to be the main source of the acting forces, energy and momentum, as well as the basis for calculating the metric of the system from the standpoint of non-quantum classical field theory. Among all the fields unified by the general field, two fields – the electromagnetic and gravitational fields – act at a distance, while the rest fields act locally, at the pave of location of one or another matter unit. The proper vector potential of any field for one particle is proportional to the scalar potential of this field and the particle velocity, if the vector potential of this particle is zero in the reference system that accompanies the particle. For the electromagnetic and gravitational fields in the system with a number of particles the superposition principle holds, according to which the scalar potential at an arbitrary point equals the sum of scalar potentials of all the particles and the same is assumed to apply to the vector potential. Due to the different rules of the vector and scalar summation, the vector potential of the system ceases to depend on the scalar potential of the system of particles. The same situation should take place for other fields. For example, the pressure near the particle depends not only on the scalar potential of the pressure field in the co-moving frame and the particle velocity, but also on the total pressure from other particles in the system. The scalar potentials of particular fields are proportional to the energy, appearing in the system during one or another interaction per unit mass (charge) of the matter, and have a dimension of the squared velocity. The vector potentials of particular fields have a dimension of velocity and allow us to take into account the additional energy, which appears due to motion. Since the 4-potential of a particular field consists of the scalar and vector potentials, then the sum of the 4-potentials of particular fields gives the 4-potential of the general field, which describes the total energy of all interactions in the system of particles and fields. This is why the general field exists as long as there is at least one of its components in the form of the particular field. From a philosophical point of view, the existence of only one particular field is impossible particular – there should always be other fields. For example, if there is a particle, whose motion is described by the acceleration field, then this particle must also have at least the gravitational field and a full set of proper internal fields inside the particle. The most natural method of describing the emergence of the general field is provided by the Fatio-Le Sage's theory of gravitation. This theory provides a clear physical mechanism of emergence of the gravitational force,     as a consequence of the influence of ubiquitous fluxes of gravitons, in the form of tiny particles like neutrinos or photons, on the bodies. The same mechanism can explain the electromagnetic interaction, if we assume the presence of praons – tiny charged particles in the fluxes of gravitons. Praons and neutral particles such as field quanta form a vacuum field contained in an electrogravitational vacuum. The fluxes of the particles of the vacuum field permeate all bodies and carry out electromagnetic and gravitational interaction by means of the field even between the bodies, which are distant from each other. The bodies can also exert direct mechanical action on each other, which can be represented by the pressure field. An inevitable consequence of the action of these fields is the deceleration of fast matter particles and bodies in the surrounding medium, which is described by the dissipation field. At last, the acceleration field is introduced for the kinematic description of the motion of particles and bodies, the forces acting on them, the energy and momentum of the motion. For bodies of a spherical shape, the chaotically moving particles of their matter can be characterized by a certain average radial velocity and an average tangential velocity perpendicular to it, the values of which depend on the current radius. It can be assumed that the radial velocity gradient leads to the radial acceleration described with the help of the pressure field. The tangential velocity of the particles also causes the radial acceleration due to the centripetal force, which can be taken into account by the acceleration field. These radial accelerations with addition of the acceleration from the electric forces in the charged matter resist the acceleration from the gravitational forces that compress the matter of massive cosmic bodies. As a result, the general field can be represented as a field, in which the neutral and charged bodies, under the action of the fluxes of neutral and charged particles of vacuum field, exchange energy and momentum with each other and with vacuum field. The energy and momentum of the general field can be associated with the energy and momentum acquired by the vacuum field during interaction with the matter, and in order to take into account the energy and momentum of the system we need to add the energy and momentum of the matter, arising from its interaction with vacuum field. In the model of quark quasiparticles it is emphasized that quarks are not real particles but quasiparticles. In this regard, it is assumed that the strong interaction can be reduced to strong gravitation, acting at the level of atoms and elementary particles, with replacement of the gravitational constant by the strong gravitational constant. Based on the strong gravitation and the gravitational torsion field the gravitational model of strong interaction is substantiated. One of the consequences of this is that the gravitational and electromagnetic fields are represented as fundamental fields, acting at different levels of matter by means of the field quanta with different values of their spin and energy and with different penetrating ability in the matter. The above-mentioned approach allowed calculating the proton radius in the self-consistent model and explaining the de Broglie wavelength. As for the weak interaction, from the standpoint of the theory of Infinite Hierarchical Nesting of Matter, it is reduced to the processes of matter transformation, which is under action of the fundamental fields, with regard to the action of strong gravitation. Similarly, the pressure and dissipation fields in principle could be reduced to the fundamental fields, if all the details of interatomic and intermolecular interactions were known. Due to the difficulties with such details, we have to attribute the existence of proper 4-potentials to the pressure field, energy dissipation field, strong interaction field and weak interaction field, and to approximate the influence of these fields in the matter with the help of these 4-potentials. 1. Fedosin S.G. The procedure of finding the stress-energy tensor and vector field equations of any form. Advanced Studies in Theoretical Physics, Vol. 8, No. 18, pp. 771-779 (2014). http://dx.doi.org/10.12988/astp.2014.47101. 2. Fedosin S.G. The Principle of Least Action in Covariant Theory of Gravitation. Hadronic Journal, Vol. 35, No. 1, pp. 35-70 (2012). http://dx.doi.org/10.5281/zenodo.889804. 3. 3.0 3.1 3.2 Fedosin S.G. Fizicheskie teorii i beskonechnaia vlozhennost’ materii. – Perm, 2009, 844 pages, Tabl. 21, Pic. 41, Ref. 289. ISBN 978-5-9901951-1-0. (in Russian). 4. 4.0 4.1 Fedosin S.G. (1999), written at Perm, pages 544, Fizika i filosofiia podobiia ot preonov do metagalaktik, ISBN 5-8131-0012-1. 5. Fedosin S.G. About the cosmological constant, acceleration field, pressure field and energy. Jordan Journal of Physics. Vol. 9, No. 1, pp. 1-30 (2016). http://dx.doi.org/10.5281/zenodo.889304. 6. 6.0 6.1 6.2 6.3 Fedosin S.G. Four-Dimensional Equation of Motion for Viscous Compressible and Charged Fluid with Regard to the Acceleration Field, Pressure Field and Dissipation Field. International Journal of Thermodynamics. Vol. 18, No. 1, pp. 13-24 (2015). http://dx.doi.org/10.5541/ijot.5000034003 . 7. 7.0 7.1 7.2 7.3 Fedosin S.G. The Concept of the General Force Vector Field. OALib Journal, Vol. 3, pp. 1-15 (2016), e2459. http://dx.doi.org/10.4236/oalib.1102459. 8. 8.0 8.1 Fedosin S.G. Two components of the macroscopic general field. Reports in Advances of Physical Sciences, Vol. 1, No. 2, 1750002, 9 pages (2017). http://dx.doi.org/10.1142/S2424942417500025. 9. Fedosin S.G. The Hamiltonian in Covariant Theory of Gravitation. Advances in Natural Science, Vol. 5, No. 4, pp. 55-75 (2012). http://dx.doi.org/10.3968%2Fj.ans.1715787020120504.2023. 10. 10.0 10.1 10.2 Fedosin S.G. The Integral Energy-Momentum 4-Vector and Analysis of 4/3 Problem Based on the Pressure Field and Acceleration Field. American Journal of Modern Physics. Vol. 3, No. 4, pp. 152-167 (2014). http://dx.doi.org/10.11648/j.ajmp.20140304.12 . 11. Fedosin S.G. The electromagnetic field in the relativistic uniform model. International Journal of Pure and Applied Sciences, Vol. 4, Issue. 2, pp. 110-116 (2018). http://dx.doi.org/10.29132/ijpas.430614. 12. Fedosin S.G. The gravitational field in the relativistic uniform model within the framework of the covariant theory of gravitation. 5th Ulyanovsk International School-Seminar “Problems of Theoretical and Observational Cosmology” (UISS 2016), Ulyanovsk, Russia, September 19-30, 2016, Abstracts, p. 23, ISBN 978-5-86045-872-7. 13. Fedosin S.G. The Gravitational Field in the Relativistic Uniform Model within the Framework of the Covariant Theory of Gravitation. International Letters of Chemistry, Physics and Astronomy, Vol. 78, pp. 39-50 (2018). http://dx.doi.org/10.18052/www.scipress.com/ILCPA.78.39. 14. 14.0 14.1 14.2 Fedosin S.G. The generalized Poynting theorem for the general field and solution of the 4/3 problem. International Frontier Science Letters, Vol. 14, pp. 19-40 (2019). https://doi.org/10.18052/www.scipress.com/IFSL.14.19. 15. 15.0 15.1 Fedosin S.G. Relativistic Energy and Mass in the Weak Field Limit. Jordan Journal of Physics. Vol. 8, No. 1, pp. 1-16 (2015). http://dx.doi.org/10.5281/zenodo.889210. 16. 16.0 16.1 Fedosin S.G. Energy and metric gauging in the covariant theory of gravitation. Aksaray University Journal of Science and Engineering, Vol. 2, Issue 2, pp. 127-143 (2018). http://dx.doi.org/10.29002/asujse.433947. 17. Fedosin S.G. The Metric Outside a Fixed Charged Body in the Covariant Theory of Gravitation. International Frontier Science Letters, ISSN: 2349 – 4484, Vol. 1, No. I, pp. 41-46 (2014). http://dx.doi.org/10.18052/www.scipress.com/ifsl.1.41. 18. Федосин С.Г. Иерархия масс в релятивистской однородной системе. Препринт, 2018. 19. Fedosin S.G. Estimation of the physical parameters of planets and stars in the gravitational equilibrium model. Canadian Journal of Physics, Vol. 94, No. 4, pp. 370-379 (2016). http://dx.doi.org/10.1139/cjp-2015-0593. 20. Fedosin S.G. The virial theorem and the kinetic energy of particles of a macroscopic system in the general field concept. Continuum Mechanics and Thermodynamics, Vol. 29, Issue 2, pp. 361-371 (2017). https://dx.doi.org/10.1007/s00161-016-0536-8. 21. 21.0 21.1 Fedosin S.G. The binding energy and the total energy of a macroscopic body in the relativistic uniform model. Preprint, June 2016. 22. Fedosin S.G. The integral theorem of generalized virial in the relativistic uniform model. Continuum Mechanics and Thermodynamics (2018). https://dx.doi.org/10.1007/s00161-018-0715-x. 23. Fedosin S.G. Model of Gravitational Interaction in the Concept of Gravitons. Journal of Vectorial Relativity, Vol. 4, No. 1, pp. 1-24 (2009). http://dx.doi.org/10.5281/zenodo.890886. 24. Michelini M. A flux of Micro-quanta explains Relativistic Mechanics and the Gravitational Interaction. Apeiron Journal, Vol.14, pp. 65-94 (2007). 25. Fedosin S.G. The graviton field as the source of mass and gravitational force in the modernized Le Sage’s model. Physical Science International Journal, ISSN: 2348-0130, Vol. 8, Issue 4, pp. 1-18 (2015). http://dx.doi.org/10.9734/PSIJ/2015/22197. 26. Fedosin S.G. The Force Vacuum Field as an Alternative to the Ether and Quantum Vacuum. WSEAS Transactions on Applied and Theoretical Mechanics, ISSN / E-ISSN: 1991‒8747 / 2224‒3429, Volume 10, Art. #3, pp. 31-38 (2015). http://dx.doi.org/10.5281/zenodo.888979. 27. Fedosin S.G. The charged component of the vacuum field as the source of electric force in the modernized Le Sage’s model. Journal of Fundamental and Applied Sciences, Vol. 8, No. 3, pp. 971-1020 (2016). http://dx.doi.org/10.4314/jfas.v8i3.18, https://dx.doi.org/10.5281/zenodo.845357. 28. Fedosin S.G. The radius of the proton in the self-consistent model. Hadronic Journal, Vol. 35, No. 4, pp. 349-363 (2012). http://dx.doi.org/10.5281/zenodo.889451.